Oneplus Avengers Offer , Avengers The Infinity War Free Tickets – Hi Guys , The Biggest Movie Of 2018 is Launching On Next Friday & Also The Next Big Flagship Killer “OnePlus 6” is Coming. 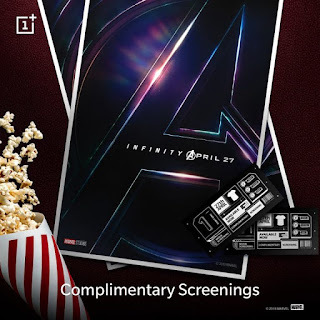 OnePlus is Celebrating This Partnership With Marvel & They Are Giving Away “Free Avengers The Infinity Wars” Tickets. OnePlus India is back with another amazing offer in which they are giving a free Tickets Plus Snacks for Avengers The Infinity War. This offer is only for those who have a Oneplus Phone. How to get Free Ticket Of Avengers Infinity War ? 1.First visit here and Register your Oneplus IMEI and if you have already registered then Log in. 3.Choose your city and confirm the movie time. 4.Click on “Get it” Button and Coupon code will be generated. 5.Now go to Paytm and Select the Same Location and time and Proceed to Checkout. 6.Enter the Coupon Code you got from Oneplus . 7. Now Pay Rs 1 as Complimentry Fees and book the tickets. 8. Enjoy your Movie along with free snacks. Ticket will go on sale on 26th April 10:00 AM 2018. Head over to the Paytm app and use this coupon to choose the movie in your city. 1 OnePlus account can get only 1 movie ticket for complimentary along with snacks for ₹1. Didn’t get the movie ticket? You can still experience the phone at the Experience Zone.